For nurse trees and nitrogen "fixers" he planted: Thuja Plicata, Eleagnus Umbellata, Corylus Avellona and Alnus Cordata. He rabbit fenced the area, used tree guards to protect against spray drift and old carpet as mulch matting. Growth rates have been phenomenal and his walnut "space rockets" have had their first (light) formative pruning in July 2002. 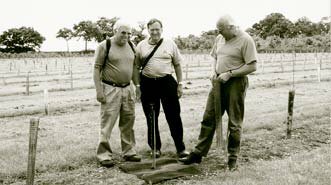 2001 - American Walnut Council experts, Bob Burke and Dr. Larry Severeid, with Robin Bircham of WTC (right) inspecting Bill’s new planting. 2002 - Bill shows off his Hybrid Walnut "NG.23" growth rate in just one year! Walnut hybrids thriving at Hulls Mill Farm, in the Woodland Heritage trial plot. These were also planted in February 2000. WTC supply the very best quality trees to growers, sourced from around the world, and proven to perform. So often in Britain inferior walnut trees are sourced from unknown origins and without any knowledge of their suitability for their planting purpose. 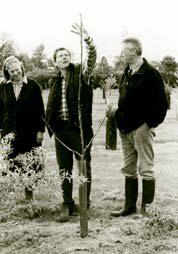 WTC has a wide range of selected timber trees for forestry and fruit trees for horticulturists and gardeners. Order soon for Spring 2003 material, or contact us for advice or stock for next season’s planting.